On behalf of the Exco of AFCMA, I wish you all a very happy Easter. It is the culmination of our journey as Catholics. It is the commemoration of Jesus’s death and resurrection, signifying the completion of his mission on earth, to redeem our sins. It is also a reminder for us to continue spreading the Good News to the people around us, through our words and actions. As medical practitioners, we too should practice Catholicism in our lives. It is important to appreciate that these two aspects are inseparable: we are both medical doctors and Catholics. It is simply impossible for us to think that we can neglect our Catholic values while doing our medical practices and only follow Catholic teachings while we are not on duty. When tested by the Pharisees, Jesus said that we ought to “give back to Caesar what is Caesar’s, and to God what is God’s” (Mark 12:17). It is entirely possible that the two can go hand-in-hand. We can carry out our duties as medical practitioners while at the same time following Jesus’ teachings in all our words and actions. Firstly, it is important for us to utilise our God-given intelligence in taking care of our patients. When assessing them, we have to take all aspects into consideration. Our analysis on our patients should not only on their physical and physiological state, but also their psychological state, social status (including their religion), and financial situations. Each of our patients is an entire entity comprising of all these aspects and should be treated accordingly. In each of our actions and the decisions we make, we have to put the patient’s needs as the primary focus. Patients should be viewed as subjects who we should treat in the highest regards. Never are they objects we can simply use to our advantage. They are much more than just our sources of income. We should remember our oaths, that we have an obligation to save lives and improve the lives of people. In our line of jobs, we are constantly faced with ethical and moral questions. These are the times where we have to exercise our conscience. It is our duties as Catholics to answer these tough questions according to our faith in Christ. At times, our final decisions could attract controversies, some of which may even result in persecutions against us. However, it is imperative to remind ourselves that we should live our faith unconditionally, and that it is in these difficult situations that our faith is tested. We have learned from our experiences during Lent that we have to introspect, inspect our conscience. As medical practitioners, we are also encouraged to continuously looking back at our experiences, at our actions for the day, and take lessons from them, to improve and renew ourselves, both as persons and as professional catholic doctors. Now that we have come to the end of the Lenten period, we should use the momentum to continue our practice to introspect and reflect upon our lives. Jesus died on the cross to redeem our sins, regardless of who we are. We have to use the same analogy in carrying our duties as medical practitioners. We must not let our personal preferences towards certain people get in the way of our primary duties to help others desperate for our assistance. Our first priority is to save lives. To conclude my message, I would like to once again emphasize that being a medical practitioner is God’s gift to us, and we have to always view it as a privilege. Therefore, it is our moral and spiritual obligations to utilise God’s gift to help others while spreading the word of God in our daily lives. I kindly offer my most sincere prayers, may the Holy Spirit guide us in all our thoughts and actions. Christmas is the time for happiness, the time of joy, the time to celebrate. Traditionally, this is the time where we reunite with the people close to our hearts. And as it happens one week before the changing of the year, it also serves as a good time to reflect on our life journey throughout the passing year. While these days a lot of these celebrations have been secularised, as Catholics, it is important for us to constantly remember that the essence of the day is to commemorate the nativity of Jesus. It marked the beginning of His mission on earth to redeem our sins. God the Father sent His only Son to the world to die on the cross to restore the broken relationship between us mortals and our Creator because of our original sins. Realising how powerful His mission was, we should feel amazed that God chose to start His journey in such humility, being born in a stable and put in a manger. The circumstances on which Jesus was born would probably be much worse than all of us when we were born. On the other hand, we also recall that earlier this year, the Princes of the Church elected Jorge Mario Bergoglio SJ to succeed Pope Benedict XVI who announced his retirement from the Papacy due to poor health. As we could see from his words and actions, Pope Francis puts emphasis on his vision to make the Church poor and for the poor. Pope Francis has repeatedly urged his followers to put more attention on the disadvantages and the helpless. As Catholic doctors, serving the poor should also be one of the central themes of our duties. The Hippocratic Oath stated that we must treat the sick, free of all intentional injustice. We also recall Jesus’ words that whatever we do the least of his brethren, we do it to Him (Matthew 25:40). Therefore, it should be the nature of our services to serve the needy. Additionally, we have to fully grasp that patients are never objects, and neither are they media to achieve our personal glory and prosperity. They are our fellow human beings who we should treat with dignity.The centre of our services should always be the patients, not ourselves. Since He was born, Jesus has taught us, by example, the spirit of humility in serving God. Throughout His life, Jesus had always been obedient to His Father. Not once did he stray from his mission to proclaim God’s love to the world. We too, as His followers, should always remember that we are both children of the earth and children of God. Therefore, in our words and actions, it is always vital to constantly remind ourselves of our Christian values. We must always remember to be humble in our services to others, and we must always focus in helping others improving their quality of life. As Pope Francis once said in 2003, each day we all face the choice to be Good Samaritans or to be indifferent travellers passing by. Which pathway do we wish to take? Christmas is a commemoration of God’s love to us sinners. It is our call as Christian doctors to pass on His grace to our fellow brothers and sisters who rely on us to save their lives and relieve their illness.May the peace of Christmas fill our hearts and strengthen us in carrying out our duties. Merry Christmas to all of us, and may God bless all of us. This article will try to discuss issues related to Advance directives with particular reference to the situation in Asia. In terms of numbers the Chinese, Muslims and Indians form the majority of the population in Asia. The religion of most Chinese including the Japanese and Korean is Buddhism. On the other hand the Muslims led by the Indonesians practice Islam while the Indians practice Hinduism. All religions teach us to do good and “Thou Shalt Not Kill”. Most countries in Asia except for the Philippines have less than 10% Catholics. In Malaysia which has a population of more than 28 million the percentage of Catholics is only 4%. Advance Directives are relatively unknown in Asia. An Advanced Directive is defined as a document with written instructions made by a person before he/she reaches the terminal phase of a terminal illness or a persistent vegetative state and incapable of asking decision about medical treatment when the question of administering the treatment arises. It is preferably a duly notarised document executed by a person of legal age and of sound mind upon consultation with a physician and family members. It directs healthcare providers to administer terminal care when the person executing such directive reaches the terminal phase of his terminal illness. Before I delve further into Advance directives it is important also to mention death/brain death, euthanasia, dysthanasia, orthothanasia, ordinary and extraordinary care and DNR or Do Not Resuscitate as they are all interrelated with Advance Directives. From the medical point of view Death can be diagnosed and certified when the heart stops and spontaneous breathing stops (conventional definition) or when the brain including the brain stem stops functioning (Brain Death definition). With the advance in Resuscitation and setting up of Intensive Care Wards some patients whose hearts had stopped or failed and whose breathing was stopping or had ceased were successfully resuscitated. A small percentage of the successfully restarted heart beating ‘survivors’ could not be taken off life supports. This group was actually ‘dead’ (by the old definition) because if there were no artificial supports (breathing machines, etc.) or if they were taken off these supports, the heart and breathing would stop. Medical advance (efficient Resuscitation and Intensive Care Units) created this problem of supporting the ‘dead’ and not as many erroneously refer to as supporting ‘life’. The concept of Brain death evolved and intensive care spread and became universally established from the 1960’s. It is now accepted that a patient in the intensive care ward requiring artificial supports (breathing machines, supportive drugs, etc.) to maintain heart/breathing functions can be diagnosed as ‘dead’ if assessment and testing of the total brain function (including Brain Stem function) shows absence of such functions that is Brain Death. The concept of Brain death has to be accepted in hospitals that run Intensive Care Units/Wards. If one does not accept Brain death as a medical entity the situation can arise whereby the ICU beds are occupied by ‘dead’ people (cadavers) on artificial supports. This is a constant dilemma faced by doctors who run ICU wards if the concept of Brain death is not understood and accepted. To diagnose brain death two specialists run through bed side tests/testing the brain stem function independently and repeat the test after a specific interval before the final conclusion is made. In countries where Organ Transplantation Programmes have been started brain death must be accepted as otherwise the only Organs for successful transplantation will only be available from living donors. By Euthanasia is meant any action or ommision which of itself and by intention causes death with the purpose of eliminating all suffering. The pity aroused by the pain and suffering of of terminally ill patients, abnormal babies, the mentally ill, the elderly and those suffering from incurable disease does not justify any form of Euthanasia either active or Passive. It is not a question of helping a sick person but the intentional killing of a person. Healthcare Personnel should always remain faithful to the task of giving service to the service of life and assisting it to the end. Human life is sacred–all men must recognize that fact (HUMANAE VITAE). Dysthanasia is meant as the undue prolongation of life by futile therapy which ends in an undignified death. It is an abusive use of extraordinary or inappropriate technological means to prolong life and is usually costly and is done for fear of a malpractice suit. Ordinary and Extraordinary Care ANH or Artificial Nutrition and Hydration is regarded as ordinary care and cannot be legitimately withheld even if death is imminent. In 2004 Pope John Paul 2nd during an International Congress on the Vegetative State stated that ” ‘The administration of water and food even when provided by artificial means always represents a natural means of preserving life, not a medical act. Its use furthermore should be considered in principle ordinary and proportionate and as such morally obligatory insofar as and until it is seen to have obtained its proper finality, which in the present case consist in providing nourishment to the patient and alleviation of his suffering. DNR or a Do Not resuscitate Order is usually executed when death is imminent. Life sustaining treatment is withdrawn from a patient in a terminal condition or in a permanently unconscious state when a medical practitioner signs a do-not-resuscitate order on the request of the patient or his representative if the patient lacks capacity to do so. The life sustaining treatment typically withdrawn is cardiopulmonary resuscitation (CPR). A DNR is morally permissible only if one can judge that CPR is excessively burdensome for the patient taking into account his or her situation and physical and moral resources or that CPR imposes excessive financial burden on the family and community. b/Second Choice—‘Limited Additional Interventions’ which includes comfort care but may also include IV fluids and antibiotics. c/Third Choice–‘Full Treatment’ which includes comfort care, IV fluids, antibiotics, CPR, the type of breathing support, artificially administered nutrition and all other intensive medical care measures including transfer to a hospital. On the surface POLST appears to be a sincere effort to encourage individuals to plan and address their end of life care needs. However POLST has a detrimental effect on Catholic Moral teaching. It makes patient autonomy an enforceable right and gives all patients whether terminally ill or not total control of their end-of-life issues.It attacks the sacred value of human life by allowing individuals to hasten their own deaths on the basis of their personal intentions . exerted independently of Catholic healthcare ethical values. Advance Directives began to be developed in the US in the late 1960’s.In 1976 Barry Keene introduced the Bill in California and the latter became the first US state to legally sanction Living Wills. In 1992 all the 50 US States had passed legislation to legalize some form of Advance Directive. Advance Directives generally fall into 3 categories: Living Will. Power of Attorney and Health Care Proxy. This is a written document that specifies what type of medical treatment are desired should the individual become incapacitated.A Living Will can be general or specific. the most common statement in a Living Will is to the effect that:- If I suffer from an incurable irreversible illness, disease or condition and my attending physician determines that my condition is terminal, I direct that life sustaining measures that only serve to prolong my life be withheld or discontinued. More specific Living Wills may include information regarding an individual’s desire for such service as analgesia (pain relief), antibiotics, hydration, feeding, CPR (cardiopulmonary resuscitation) and the use of life support equipment including ventilation. This is a legal document in which an individual delegates another person to make health care decisions if he or she is incapable of making his/her wishes known.The health care proxy in essence has the same rights to request or refuse treatment that the individual would have if capable of making and communicating decisions. Through this type of Advance Directive an individual executes legal documents which provide the power of attorney to others in the case of an incapacitating medical condition. The Durable Power of Attorney allows an individual to make bank transactions, sick social security checks, apply for disability or simply sign cheques to pay the utility bill while an individual is medically incapacitated. While the Western Countries like the US has legalized some form of Advance Directives, the latter is relatively unknown in Asia. Up to date only Singapore has passed its Advance Medical Directive Act (Chapter 4A) on July 1997. This is an Act to provide for and give legal effect to Advance Directives to medical practitioners against artificial prolongation of the dying process and for matters connected therewith. The Act permits only natural death and not euthanasia or abbetment of suicide. The Advance Directive does not affect palliative care. Any Person who makes a Directive shall register his Directive with the registrar of Advance Medical Directives. Also any person who has made a Directive may in the presence of a witness revoke the Directive in writing, orally or in any other way in which the patient can communicate. The Medical Practitioner responsible for the treatment of the person who has been certified terminally ill shall obtain the opinion of 2 other medical specialists as to whether they agree to with the determination that the patient is terminally ill. Terminal illness means an incurable condition caused by injury or disease from which there is no reasonable prospect of a temporary or permanent recovery where a/death would within a reasonable medical judgement be imminent regardless of the application of life sustaining treatment and b/the application of extraordinary life sustaining treatment would only serve to postpone the moment of death of the patient. A few other countries in Asia are presently trying to promote Advance Directives in their country. In Hong Kong in 2006 the Law Reform Commission released their final report on ‘Substitute Decision making and Advance Directives in relation to Medical treatment’ and recommended the promotion of Advance Directives but not Legislation.Chinese family members often play a very influential role in relation to end-of-life decisions. The Chinese often view overt reference to death as taboo and would like to talk about death. A Wong et al study showed that 6%of those not engaging in Advance Directives did so because of family objections. In Japan terminally ill patients also rely on Family Members and Physicians for making end-of-life decisions (Kinoshita 2007). These cultural differences are common in Asian countries and may result in patient’s medical directive preferences be override. Current Korean Medical Law does not include categories for end -of-life care but the Law concerning emergency medical care states that “Physicians are not allowed to discontinue emergency care without appropriate reasons. Therefore if ill patients are transferred to ICU they must be kept on ventilators until death, brain death or a judicial decision from a court of law (YS LEE 2009). In The Philippines in July 2004 an Act was presented to their House of Representatives to be passed. This Act was introduced by Rodriguez D. Davidas Declaring the Rights and Obligations of Patients and Establishing a grievance mechanism for Violation thereof and for other purposes. This Act shall be known as the Magna Carta of Patient’s Rights and Obligations. Advance Directive is included in this Act—Any Person of legal age and of sound mind may make an Advance directive for physicians to administer terminal care when he suffers from the terminal phase of a terminal illness. Advance directives and the interrelated bio-ethical issues like Euthanasia and Brain Death have been described. Whilst Advance Directives are commonly used in the Western countries like US and are legalized, in Asia only Singapore has legalized it. Due to our cultural differences Advance Directives may not be popular in Asian countries as the Family Bond is very strong amongst Asian Families. Finally Advance Directives attacks the sacred value of human life by allowing individuals to control their own end-of-life issues independent of Catholic Healthcare Ethical Values. 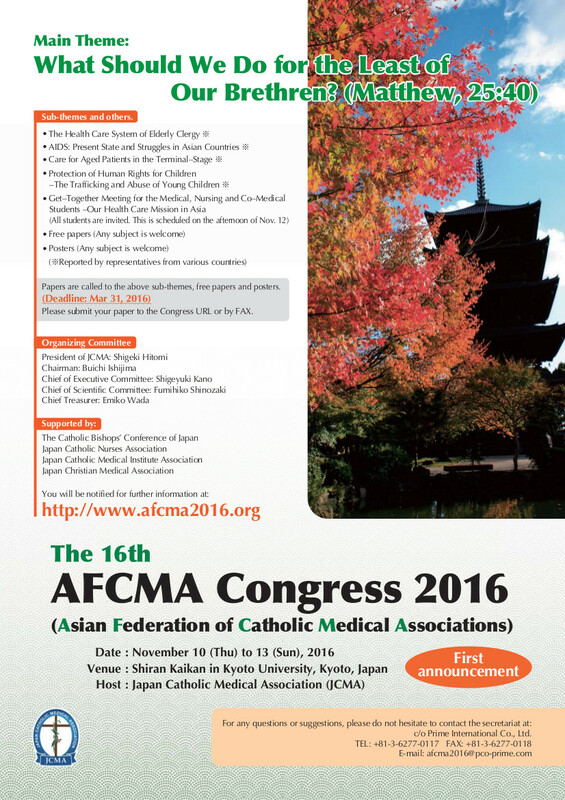 Prepared by Dr. Freddie Loh Immediate Past President of AFCMA and Asian Representative to FIAMC. The Argentinian Jesuit Jorge Mario Bergoglio was just elected Pope a few weeks ago, just before Easter, taking the regnal name Francis. Nevertheless, through his nature and character, he has established his own style of Papacy, much to the admiration of a lot of us. As Catholic doctors, there is a lot we can learn from Pope Francis, and we should actually look up to him as a role model in serving the people. Inspired by St. Francis of Assisi, he is a figure who is humble and very concerned about the poor and disadvantaged. When we identify ourselves as Catholic doctors, we are not mere doctors who happen to believe in the Catholic faith, but we are medical professionals who incorporate Catholic teachings into our daily activities. Do we base our actions on the honest intention to improve the general well-being of people or is making money our sole reason of carrying out our duties? Have we shown humility as doctors and provide the most sincere care to our patients, or do we just consider them as objects? In treating our patients, do we consider all of them equal? Or do we turn a blind eye on our patients who are struggling financially? It is important to acknowledge the reality that a lot of the world’s 7 billion people are living under the poverty line. In line with this, we have to also appreciate that a lot of these impoverished people have trouble accessing the appropriate healthcare they deserve, particularly in the developing countries in Asia, Africa, South America, and Eastern Europe. In my opinion, the first point we have fully grasp is that we could become who we are now as medical professionals not only because of our talents and efforts, but also because of God’s will. Through His grace and with His blessings, we develop our talents and skills to become experts in our respective medical fields, such as cardiology, surgery, gynaecology, and so on. Using this expertise to serve the patients with sincerity and humility, especially those who are financially disadvantaged, is our noble way to thank God for the privileges He has given us. We have to remember Jesus’ message to us when He talked about the kingdom of heaven and the last judgment (Matthew 25:31-46). There He emphasised that whatever we do to the least of his brethren, we do it to Him. It is through these lowly and poor people that we could see the face of Jesus. Furthermore, as we recall, from the parable of the good Samaritan, the two greatest commandments Jesus gave us are to love God unconditionally and to love others as ourselves (Luke 10:25-37, Deuteronomy 6:5, Leviticus 19:18). Combining this with our oath, is it important to always realise that it should be our nature to serve people without discrimination. Pope Francis has called us all, including us medical professionals, to care for and serve the poor. It is one of the, if not the, central theme of his Papacy. He has said that he wants the Church to be the Church for the poor. There are a number of inspirational people we can view as examples to serve the lowly. Saint Damien of Molokai SS.CC., despite not being a medical professional himself, devoted his life to care for the physical, spiritual, and emotional needs of those in the leper colony in Hawaii. We then also have Blessed Mother Teresa of Calcutta, who showed great devotion to care for the disadvantaged people from the slums of India. More recently, we have Fr. John Lee Tae-Soek SDB, a Korean medical doctor who dedicated his life to the services of the poor people with leprosy in war-ravaged Southern Sudan. Pope Francis also reminded us to put more emphasis on human life and dignity on top of other material matters. The pro-life movements should focus their actions not only to prevent abortion, but also to save people’s lives and prevent euthanasia. On the other hand, in the recent times, we have witnessed the advances of medical technology which are able to provide the best treatment for various diseases and illnesses. Unfortunately, a lot of these technologies are only accessible to very few people who have significant financial advantage to afford them. If we flash back to a quarter of century ago, when these technologies were not invented, doctors were still able to utilise purely their talents and skills to accurately diagnose and provide the appropriate and acceptable treatment for the same diseases and illnesses. A lot of doctors in the recent times rely heavily on these very expensive technologies, although they might not provide significant advantage over the conventional techniques employed decades ago. Even worse, these doctors are often pressured by the medical institution (e.g. the hospital) to utilise these cutting-edge technologies, albeit unnecessary, to pay off the debt for purchasing the equipment. The point to highlight here is to warn us Catholic doctors not to fall into the traps of commercialisation of our services. Again, it is imperative to constantly remind ourselves that we should put more focus of our duties on the patients and not the institutions we work for. May this thought empower us Catholic doctors to serve with our sincere heart, providing the healthcare to all patients regardless of their background, especially their financial situations. Remember, with His love, God has given us talents and privileges. Thus, it is only appropriate to share the love to others, especially to those who earnestly need our help; those who are poor and disadvantaged. Caring for the least of His brethren is our way to glorify His name. Let us pray so that God bless us in all our duties to serve Him and others.